The legendary Apollo chassis from Roberts Space Industries is the gold standard in medivac and rapid emergency response, having provided critical aid to the known universe for well over two centuries. When one thinks of first class medical rescue, one thinks of the RSI Apollo. Along with superior armor and dual missile racks, the 2948 Apollo Medivac pays homage to the classic 2910 film, Astromedics: Back from the Brink, thanks to livery that accurately recreates the headlining Kithara, lending a thoroughly modern ship a decidedly retro vibe. 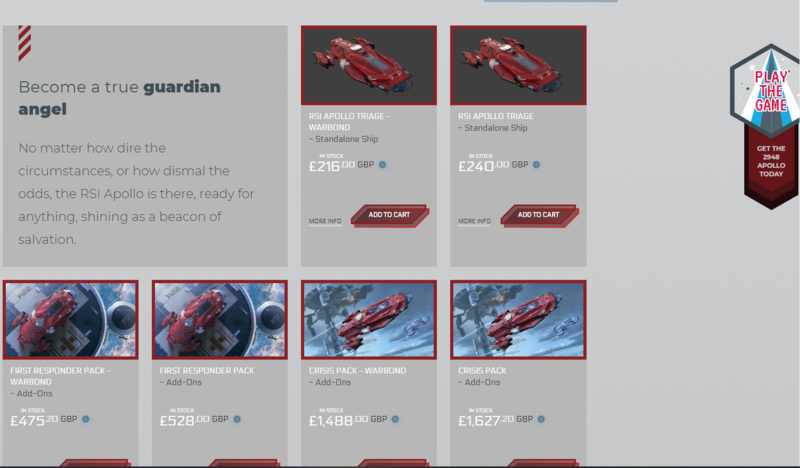 The RSI Apollo is being offered for the first time as a limited ship concept pledge. This means that the ship design meets our specifications, but it is not yet ready to display in your Hangar or to fly in Star Citizen. The Warbond pledges shown here include Lifetime Insurance on the ship hull. In the future, the ship price may increase and Lifetime Insurance or any extras may not be available. 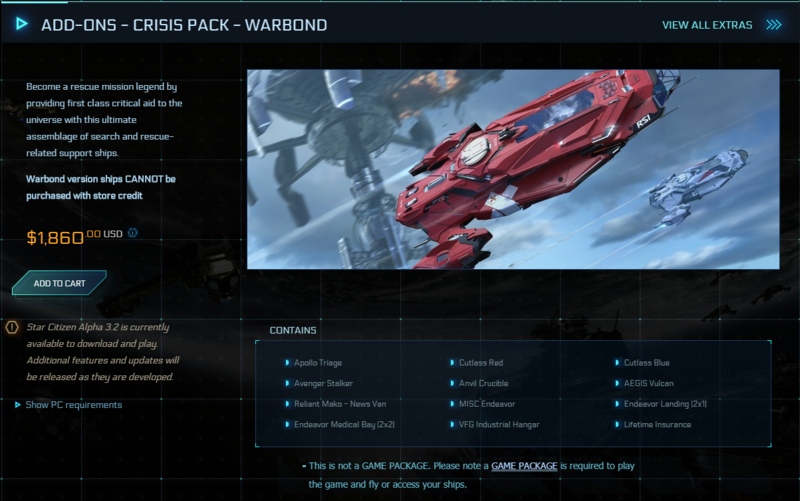 If you are interested in adding one to your fleet, a quantity of Warbond Apollo hulls are available during this event. The Apollo will be available in the pledge store until August 22nd, 2018. As with every concept ship pledge, we will also be doing a Q&A post. If you have additional questions, there will be a forum thread on Spectrum to take your questions. Make sure to vote for the questions you most want to see answered and we will be posting the dev’s responses next week. Look for the Comm-Link Schedule next week to find out when that post will go up. 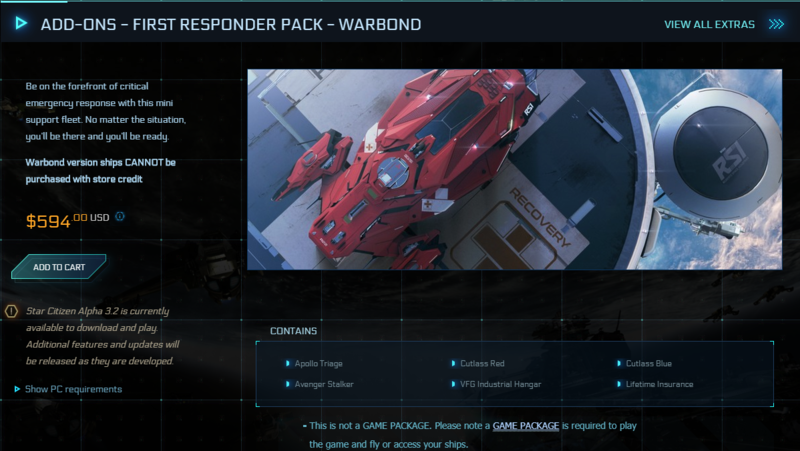 Remember: we offer pledge ships to help fund Star Citizen’s development. The funding received from events such as these are what allow us to include deeper features in the Star Citizen world. Concept ships will be obtainable in the final universe, and they are not required to start the game. Additionally, please note that the Apollo will be entering the ship pipeline now and may be released after other concept ships have been completed. The goal is to make additional ships available to continue expanding the depth and variety of the game world and give players a different experience rather than any particular advantage. I just picked up a CCU from a Vulcan to the Apollo Medivac ($75). I never wanted the Vulcan, but it came with a pack. I've been waiting for an opportunity to CCU it. The thing that really made me pull the trigger here is that it will fit in the Endeavor Hope's hangar, and I already have an Endeavor Hope. I'm honestly not sure whether i'd prefer to captain the Endeavor Hope while a friend captains the Apollo Medivac, or vice versa. I guess I'd want to do both at different times. Anyway, this removes the Vulcan from my fleet at least. I have zero desire to play the refueling or repairing game loops. I quite look forward to paying someone else to bring fuel to me and to handle my repairs.